This book is a replica of the original from the collections of The New York Public Library; it was produced from digital images created by The New York Public Library and its partners as part of their preservation efforts. To enhance your reading pleasure, the aging and scanning artifacts have been removed using patented page cleaning technology. We hope you enjoy the result. About Marion Holland (Author) : Marion Holland is a published author and an illustrator of children's books. 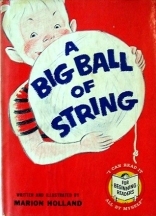 Some of the published credits of Marion Holland include A Big Ball of String.